Peeling ceiling tiles, dingy lighting, low ceilings, dirty hallways, flashing neon signs, dilapidated gates and haphazard seats — no, I’m not talking about a warehouse out in the boondocks, I’m talking about the scene that currently greets visitors to our nation’s largest city at New York’s LaGuardia Airport. Luckily, though, LGA is in for a substantial makeover. 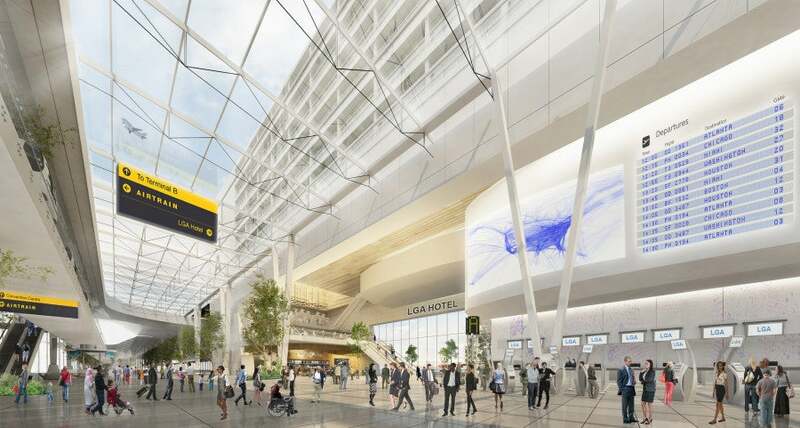 New York Governor Andrew Cuomo and United States Vice President Joe Biden announced a brand-new plan for LaGuardia Airport yesterday that would completely replace the four separate terminals with a central terminal at a cost of $4 billion. One of the three airports that comprises the busiest airport system in the country, LaGuardia’s a long-loathed dark mark on a city with an already-strained transportation presence. For many visitors, LaGuardia has become synonymous with traffic, delays, flight cancellations and an overall miserable experience. The airport also holds the distinction of being physically closest to Manhattan, at just seven miles from Midtown — even if it doesn’t always feel like it amidst the traffic and lack of rail connections. The new unified terminal at LaGuardia is expected to provide much-needed space for security and check-in operations. All photos courtesy of Governor Cuomo’s office. A little over a year ago, Biden famously said that if he were to blindfold someone and take them to the much-maligned airport, they’d think they were in a third-world country. Now, Cuomo and Biden are announcing a brand-new terminal to completely replace the four separate terminals currently at the airport, unifying all flights under a central terminal — essentially building a completely new airport. The new airport will be located a bit closer to Grand Central Parkway, providing easier access by car. 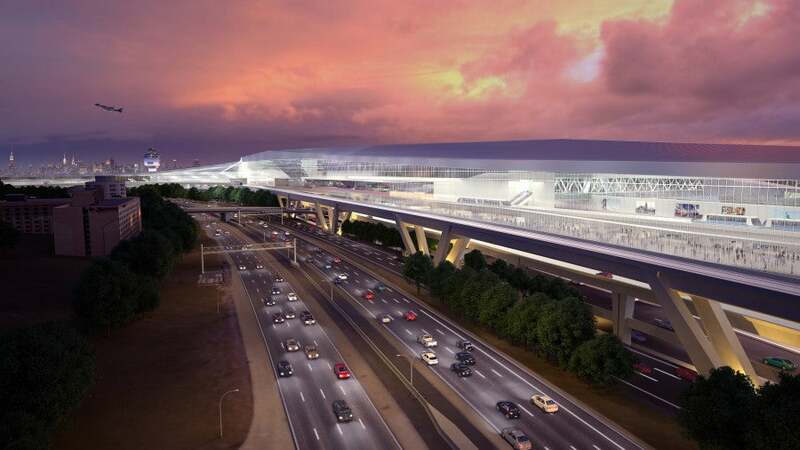 The new terminal is expected to be located 600 feet closer to Grand Central Parkway. With high bridges that will span the gates and a terminal that will allow airplanes to pass underneath, there should be more space for aircraft operations and shorter taxi lines. 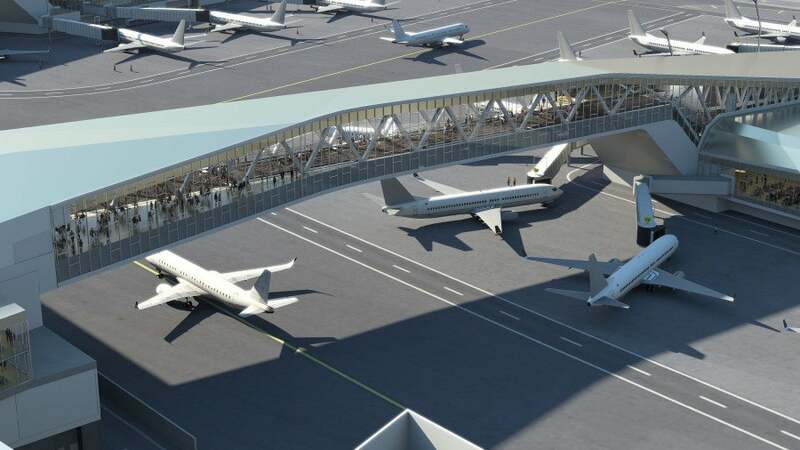 A skybridge will bring passengers from the check-in area to the concourse gates, providing more space for aircraft movement. Contrary to initial media reports, which stated that the airport construction would take only 18 months, the new terminal is expected to open for passenger traffic in 2019, with full completion 18 months after that. Construction is expected to begin as soon as next year, pending approval from the Port Authority Board of Directors. Also included in the plans are new mass transit options: a high speed ferry that will depart from the current Marine Air Terminal, and a new AirTrain that will connect to the New York City subway and Long Island Rail Road at Mets-Willets Point Station — but no direct connection to the subway. 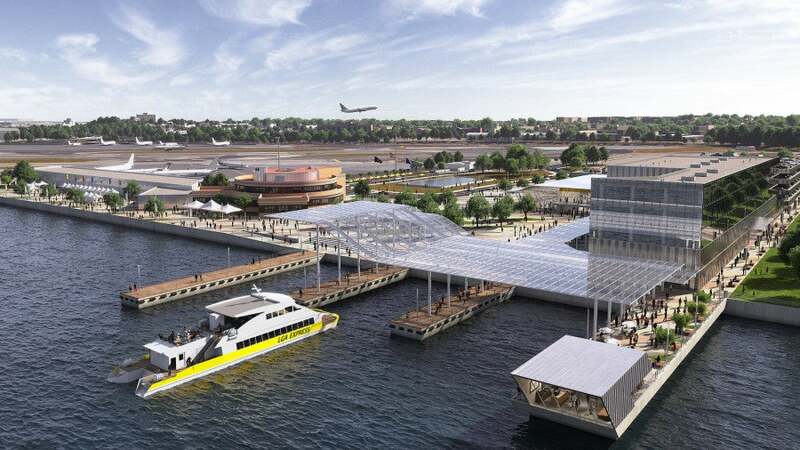 A new ferry terminal will connect the Marine Air Terminal to Manhattan. The $4 billion cost of the airport is expected to be funded half by the government, and half by the public sector. Delta Air Lines has been called out as an important proponent of the plan, and will be supporting the project significantly. Despite many rumors in the past few months, there’s no word on whether the perimeter restriction, which currently prohibits flights from the airport longer than 1,500 miles, will be lifted. There’s also no indication as to whether the new airport would include a US Customs and Border Protection presence, which would allow for international flights from destinations that don’t have a US Pre-Clearance Facility. It’s extremely refreshing to see such a massive overhaul to one of the area’s biggest problems, and while there’s no guarantee that this project will pan out exactly as planned, there is hope for the future.